DR. TERRY FINERMAN graduated from Northwestern University in 1990 with a Ph.D. in Materials Science and Engineering where his dissertation field was polymer science. 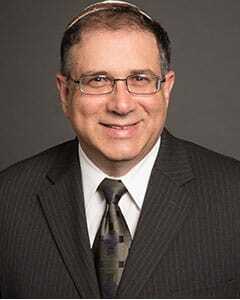 Dr. Finerman received his Bachelor of Science degree in Materials Science and Engineering at Cornell University in 1983. Dr. Finerman’s academic background included coursework and research in metallurgy, semiconductors, ceramics, polymers, computer programming, statistics, biology, physics and chemistry. Dr. Finerman is a registered patent attorney with the United States Patent and Trademark Office. Dr. Finerman has nineteen years of experience in industrial research and research management at Advanced Elastomer Systems, L.P. (division of ExxonMobil Chemical Company) in Akron, OH, L&L Products in Romeo, MI, and MSI Technology in Arlington Heights, IL. He has over fourteen U.S. patents and patent applications and over fifty international patents and patent applications, primarily in the fields of thermoplastic elastomers, composite structures, weldable polymeric compositions, structural adhesives, and sealant materials. Dr. Finerman joined The Dobrusin Law Firm in 2006 as a Staff Scientist. As a Registered Patent Attorney, he is currently preparing and processing patent applications, primarily in materials science, polymers science, chemistry and related fields, as well as assisting in other intellectual property research matters.